Letter from LP to Henry Allen Moe, Guggenheim Foundation, RE: The extension requested by Dr. Hedberg with regards to his fellowship is justified. Furthermore, Donahue's request for a grant increase is also acceptable. Also favors the granting of a fellowship to Blum. 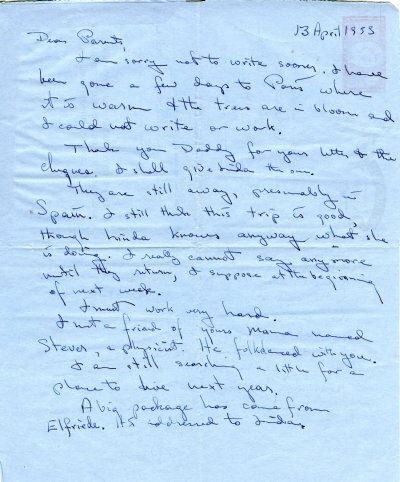 [in reply to April 6, 1953 letter from Moe to LP]. [Filed under LP science: Box 14.015, Folder 15.1]. Letter from W. P. Woodring to LP RE: was also glad to see LP at the Academy tea, though was sorry that they didn't get to talk. [Letter from LP to Dr. Woodring March 13, 1953] [Filed under LP Correspondence: Box #444, File #1].